Where do we start? Jimmy Red is a wonderful, almost extinct, red dent corn that fed the coastal areas of South Carolina, Georgia, and Florida many, many decades ago. This is not Bloody Butcher! Jimmy Red carries a mysterious past. It was grown in the south as heirloom, but it was a Native American corn that found its way from Florida, through Georgia, and up to Charleston, South Carolina. Its past is rooted in a blue Indian corn, which led to this historic corn. Jimmy Red is much higher in bricks (sugar,) which historically led its way to the whiskey/moonshine business. Because of the high brick content, it makes a fantastic eating corn. It is famous for sweet roasting ears, corn meal and grits. In the Charleston area of South Carolina it now has a cult following in many restaurants. Our seed came from Glen Roberts and the great folks at the Carolina Gold Rice Foundation. Jimmy Red is a 105-115 day corn and has a 10-12 inch ear on 8-10 feet tall plants. Folks, this is a fine……fine…..rare corn. It differs from Bloody Butcher in that it is a pure strain of corn that is high in protein and bricks, thus leading to a sweeter taste. Bloody Bucher is a great corn…..make no mistake! 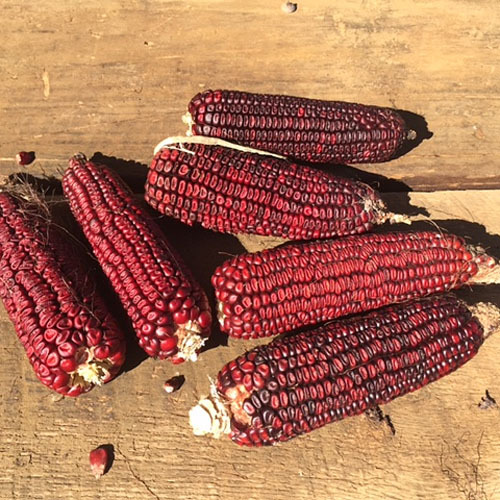 It can produce more ears with tighter rows of kernels, but in my experience in growing both, Jimmy Red tends to be slightly more vigorous during dry times. It could be the pure native gene….I don’t know, but my field of Jimmy Red is more vigorous and faster growing than the field of Bloody Butcher. Now again, I like both, but Jimmy……well…..it is very special.